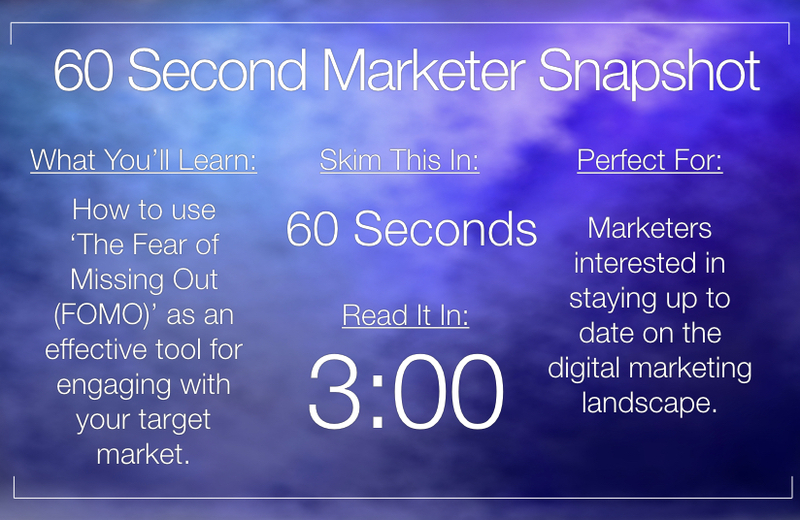 The Fear of Missing Out (FoMO) can be an extremely useful marketing tool. But FoMO has decidedly negative connotations among researchers and consumers, according to Eric Barker, writing for Time. These connotations come with good reasons. Eric cites a study about FoMO and positions it as a negative influence on the lives of social media users. FoMO is an extremely useful tool for engaging with your target market, but you need to make sure you’re using it in a sustainable and ethical way. Social media users burn out from this feeling, so it’s important to treat their time and energy with respect. 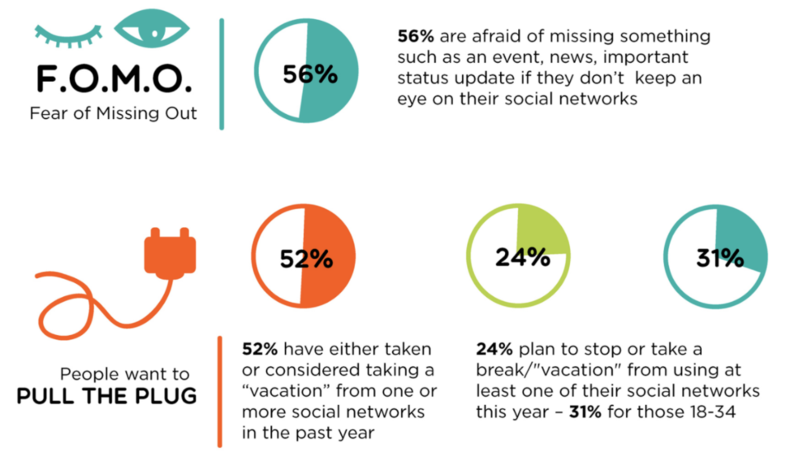 Other studies have suggested that FoMO contributes to burnout, and causes users to take breaks from, or leave social media channels altogether. So over-use of this particular tool could be doing long term damage to your brand, as users most likely to engage with FoMO tactics leave the platforms you’re trying to reach them on. The news isn’t all grave. FoMO can be used by marketers to great effect, without engaging in practices that are damaging to people’s mental health. The key to using FoMO effectively in a social media campaign is making sure that you maintain your campaign’s credibility. You can do this a number of ways. By providing quality free content that users will genuinely not want to miss out on, and by avoiding marketing clichés that make users want to remove your content from their dashboards. There are a few keys to leverage FoMO that increase the engagement of your audience without the negative connotations. People are getting pretty tired of blatant emotional manipulation during ad campaigns, they’re getting wise to hype about products and frustrated with being told what they need. We all know how saturated the social media world is with competitors. It’s tempting to double down on aggressive messaging to try and reach your audience more directly. But the opposite might be better strategy. When you do catch someone’s attention, try and keep it in other ways. Focus on rewarding their investment: provide good content that they really don’t want to miss out on, rather than hyping it up too much. Set an expectation of regular content. This doesn’t have to mean posting constantly — high quality updates once a week, or even once a month, can set that expectation. If you’re producing content of value, people won’t want to miss out on it. There are a number of social media managers and tools you can use to develop and maintain a content editorial calendar, to begin setting expectations. While you’re at it, start diversifying your content. Video content has proven results when it comes to click through and engagement. Setting up webinars and live streams are perfect ways to take advantage of FoMO in an ethical manner. You’re providing people with information and entertainment, things they genuinely don’t want to miss out on. You can increase the importance of catching your events live by emphasizing the Q&A and discussion elements of these events, and finding ways to get people to interact like taking live questions via Twitter. The simple key to making use of FoMO ethically is to give back. Don’t let the user come away with an empty feeling, or feeling like they’ve been manipulated. Reward a user’s time with quality content that informs, entertains, or both. This type of audience building can increase your reputation and create a following of users who return week on week for more updates. Poor practices that are clearly taking advantage of FoMO can make users angry, and create PR problems. So making sure you’re holding yourself accountable is important for the long-term success of your business. Aggressive FoMO strategies might work well for campaigns at the moment, but as social media users become more savvy, and more burned out, they could end up costing you in the long term. About the author: Avery Phillips is a freelance writer currently making her home in the weather-crazy hills of Idaho. When she isn’t writing, she’s usually out enjoying nature on a hike, a bike ride, or weekend camping.